In late June of 1863, Union Major General William S. Rosecrans launched a massive offensive from his base in Murfreesboro in an attempt to drive Confederate General Braxton Bragg’s 43,000-man Army of Tennessee from its entrenchments at Shelbyville and Wartrace, and possibly out of the state. The Union commander planned to capture Chattanooga and, in his words, “rescue loyal East Tennessee from the hands of the rebels.” The campaign was bold and swift, with relatively few engagements. By July 4th, the Union’s Army of the Cumberland, 70,000 strong, had forced a Confederate retreat to Chattanooga, leaving nearly all of Tennessee in Union hands. To maneuver Bragg out of his Shelbyville trenches, Rosecrans divided his army into four independent columns. marched southeast, down the Manchester Pike (US 41), the main road to Chattanooga. A fourth column, commanded by Major General Thomas L. Crittenden, advanced due east along the McMinnville Turnpike (US 70) before turning south to cross the Highland Rim below Bradyville, at Gillie’s Gap. Rosecran's goal was to get the bulk of his army here, to Manchester, push on to Tullahoma, and capture the road to Chattanooga before the Confederates had a chance to respond. Only rain and the poor conditions of the roads slowed the Union advance. Erected by Tennessee's Backroads Heritage. Location. 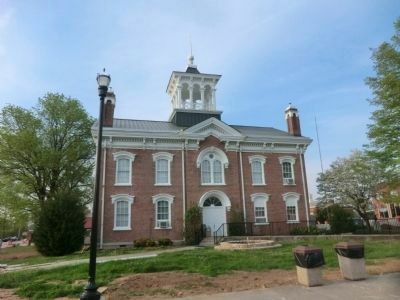 35° 28.984′ N, 86° 5.34′ W. Marker is in Manchester, Tennessee, in Coffee County. Marker is at the intersection of West Main Street and North Irwin Street, on the right when traveling west on West Main Street. Touch for map. 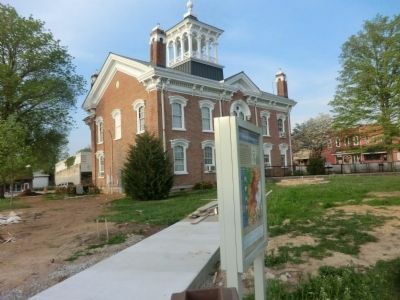 The marker is on the grounds of the Coffee County Courthouse. Marker is in this post office area: Manchester TN 37355, United States of America. Touch for directions. Other nearby markers. At least 8 other markers are within 6 miles of this marker, measured as the crow flies. A different marker also named Tullahoma Campaign (here, next to this marker); Corporal Brian James Schoff (within shouting distance of this marker); The Civilian Conservation Corps (within shouting distance of this marker); Experiment in Armor (approx. 0.3 miles away); Pioneer Armored Maneuvers (approx. 0.4 miles away); Old Stone Fort (approx. 0.6 miles away); Granny Hickerson Cemetery (approx. 1.7 miles away); General Henry H. "Hap" Arnold (approx. 5½ miles away). Touch for a list and map of all markers in Manchester. More about this marker. This marker is back-to-back with a similar marker (75355). More. 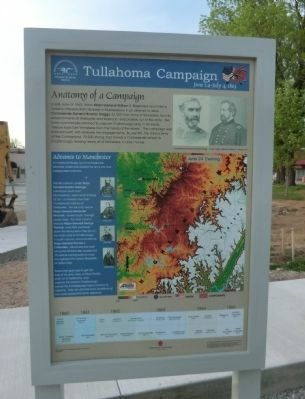 Search the internet for Tullahoma Campaign. Credits. This page was last revised on September 14, 2017. This page originally submitted on July 15, 2014, by Don Morfe of Baltimore, Maryland. This page has been viewed 390 times since then and 14 times this year. Photos: 1, 2, 3. submitted on July 15, 2014, by Don Morfe of Baltimore, Maryland. • Bernard Fisher was the editor who published this page.